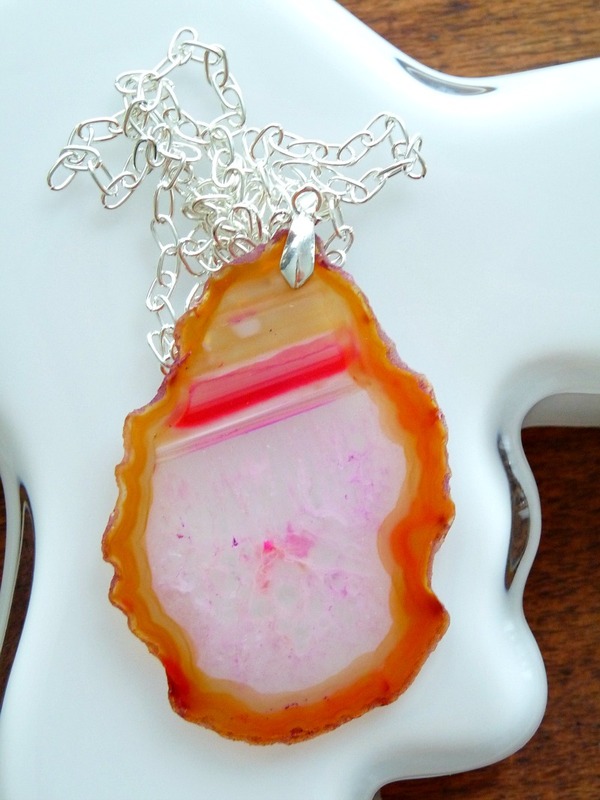 Like my new DIY agate slice pendant necklace? 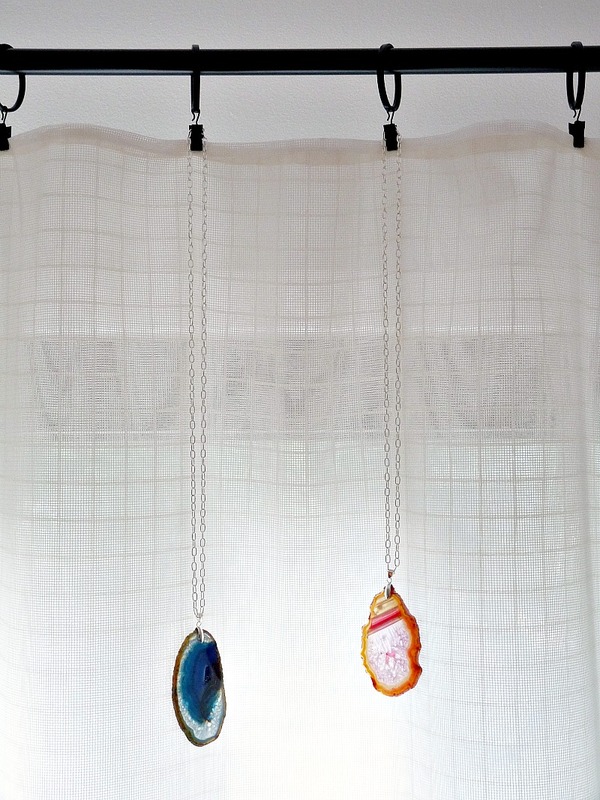 After ogling and pinning a slew of dyed agate necklaces, I started to really want one. 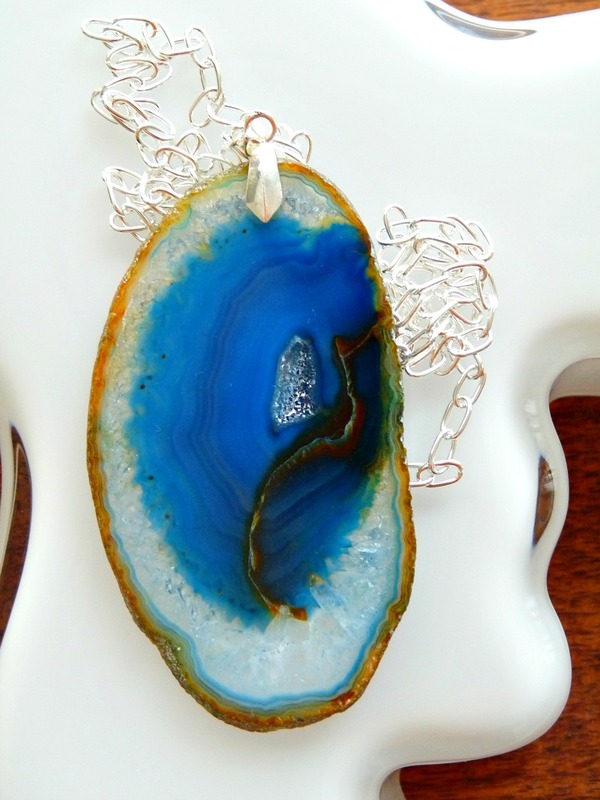 I actually had a pretty agate pendant as a kid (I’ve always liked rocks), but for the life of me can’t find it now. With my travel looming, I just couldn’t fathom coughing up the $40+ bucks to buy one. But I couldn’t pine any longer, so Hubs and I made a couple of these DIY gems. Yep, Hubby helped me make these so I could snap photos. How sweet is that? Did I mention we did this DIY on his birthday? I wasn’t being cute when I admitted that I am a bad wife! We started with two slices of dyed agate I bought at the gift shop of the New England Aquarium, for $1.99 a piece. They remind me of a fun trip we took together. We grabbed some silver bails from the craft store, but they needed some customizing. Yep, Hubs came with me to the craft store, too. How else can I use two 40% off coupons on the same day?!? If you don’t mind ordering online, you can find bails that just glue right on to a stone, like these. But I do prefer the extra security of a bail that grips the stone from both sides. 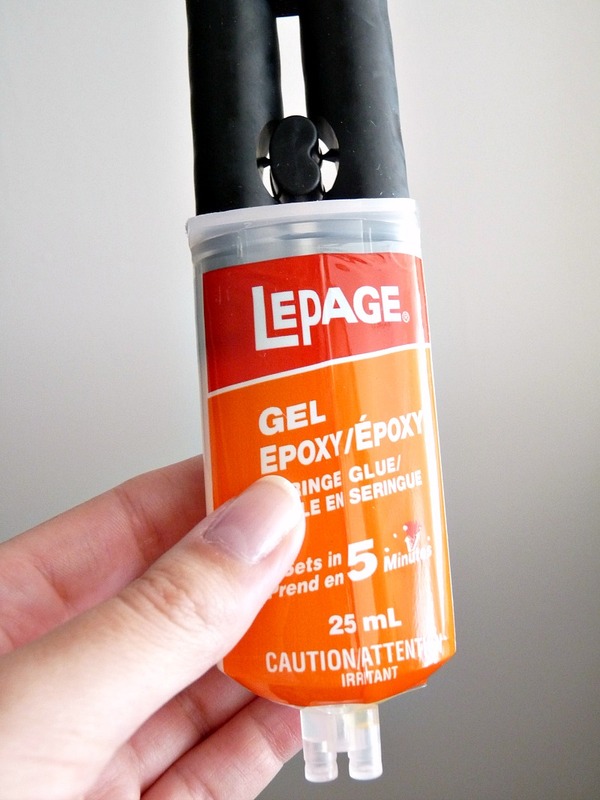 We used our favorite LePage gel epoxy to attach the bail. You mix the two parts together on the spot and have to work quick, but the hold is strong! 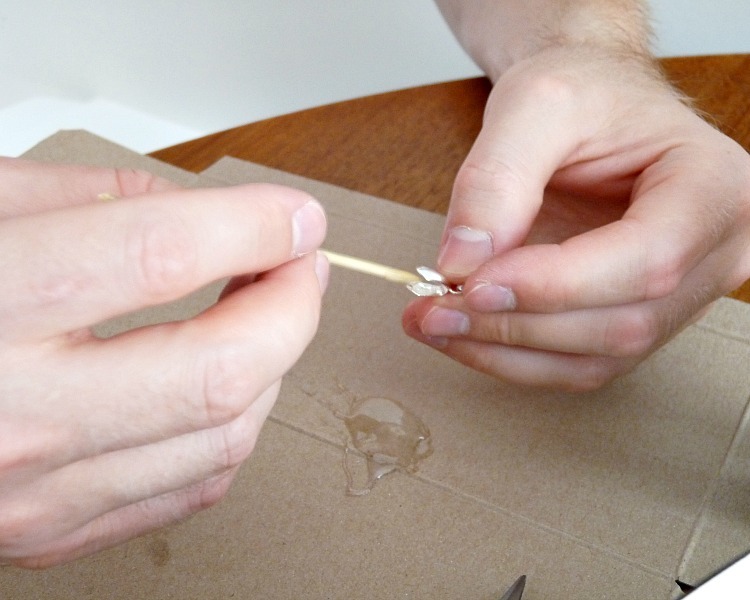 The epoxy sets really quickly, but I still set it aside overnight before wearing it. 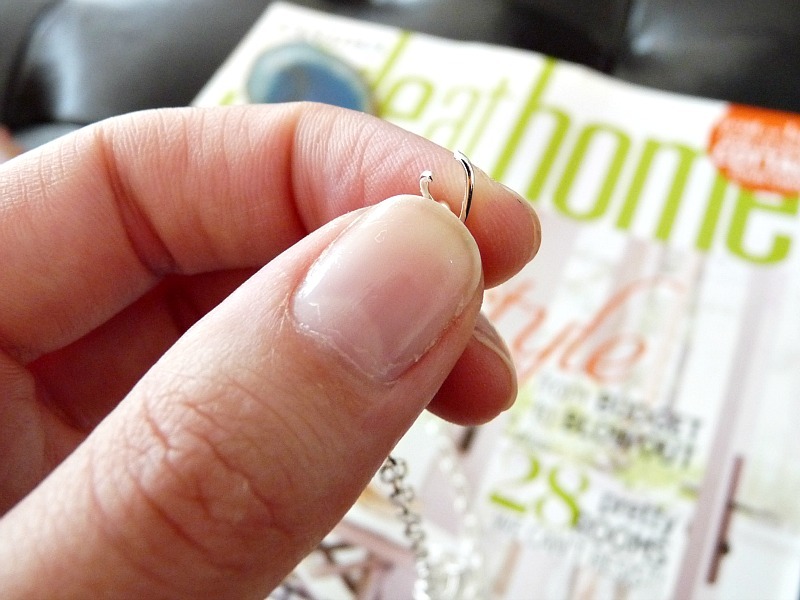 I had also grabbed a spool of some silver plated chain from the craft store (with the second coupon, haha). I snipped off one link to make the chain the length I wanted and strung on the agate pendant. 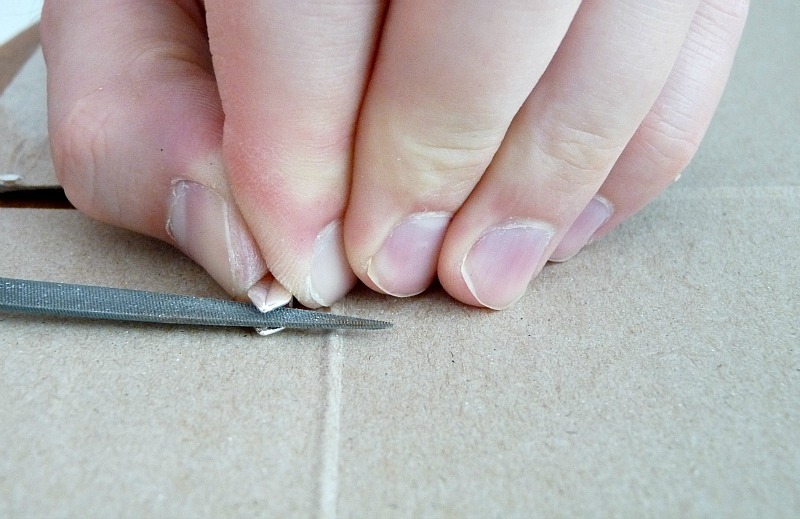 Then I used pliers to open a link at one end, which I looped on the last link at the other end and closed. And that’s it! 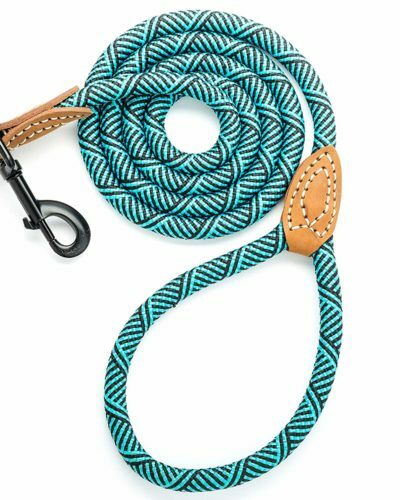 You could add a clasp if you want a shorter length, but mine are large enough to slip over my noggin. I’ve been rocking the dark blue one with my bright orange Calvin Klein dress (from Winner’s) and the pink one with pale greys. 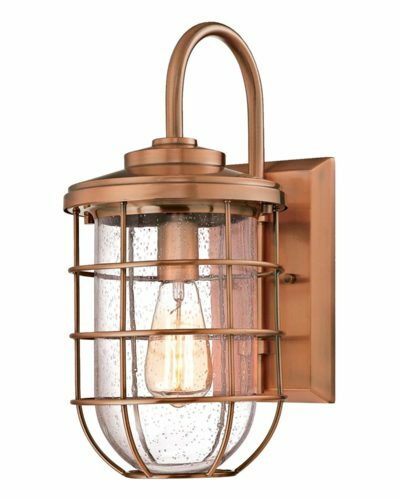 I love how pretty these are – and how inexpensive! 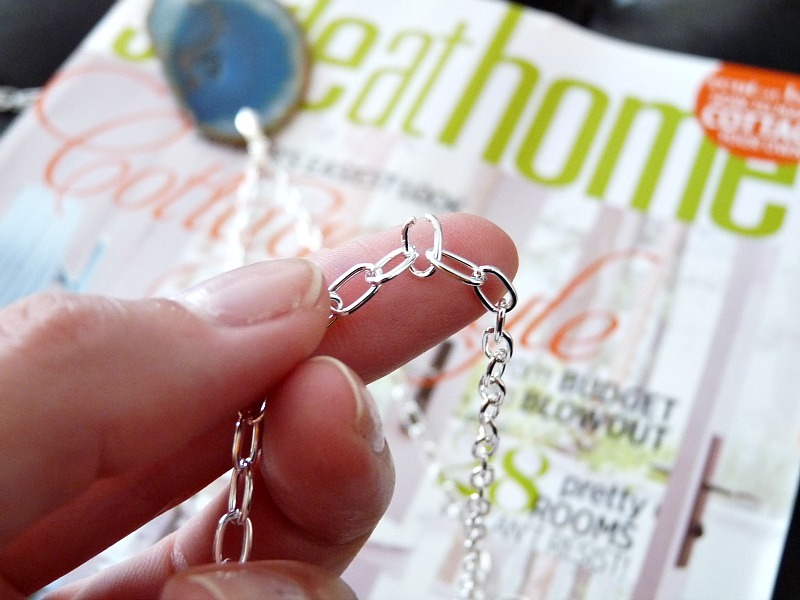 Using craft store coupons for the chain and bails, both necklace together cost less than $10.00 (I’m not counting the epoxy, because that’s a staple for us)! 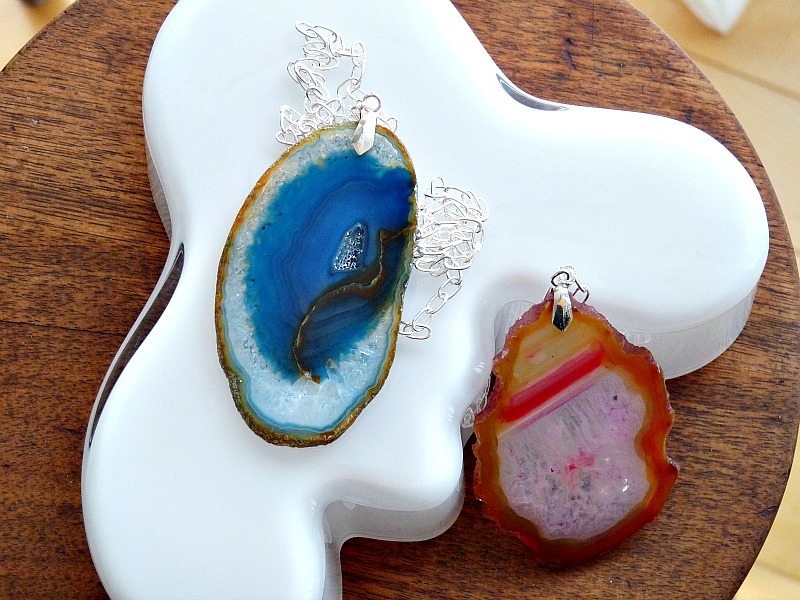 These DIY agate slice necklaces would make such sweet gifts. Your husband is most definitely a keeper! The necklaces you 2 created are beautiful! I’ve had my eye on a few agate beauties for a while but just couldn’t quite bring myself to pay that much money. 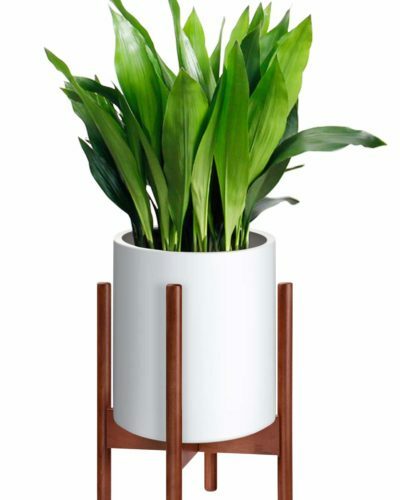 Adding this to my ever-growing craft list! Ooo, can't wait to see your version. I bet it will be gorgeous! Don't worry, my "to-do" craft list is miles longer than my "done" list. So amazing!! Wow! I know your Etsy shop is thrifted finds but these would sell like hot cakes! 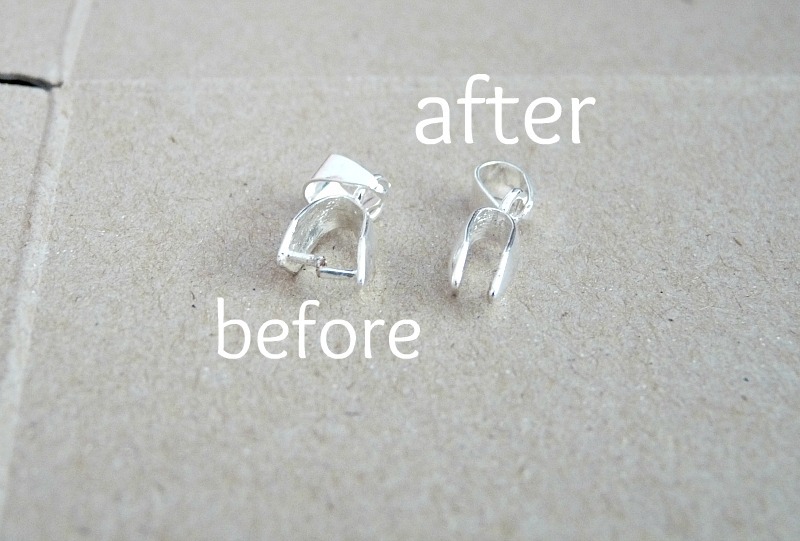 Everything on Etsy jewelry-wise is so expensive! Thanks, Emily! I am planning to add more jewellery, with some handmade baubles, when we re-open in the New Year. I might have to track down some more agate and whip up some more. I second everything you said. And I third everything! Love it! PS Heck yes I would buy these if you listed them on Etsy. 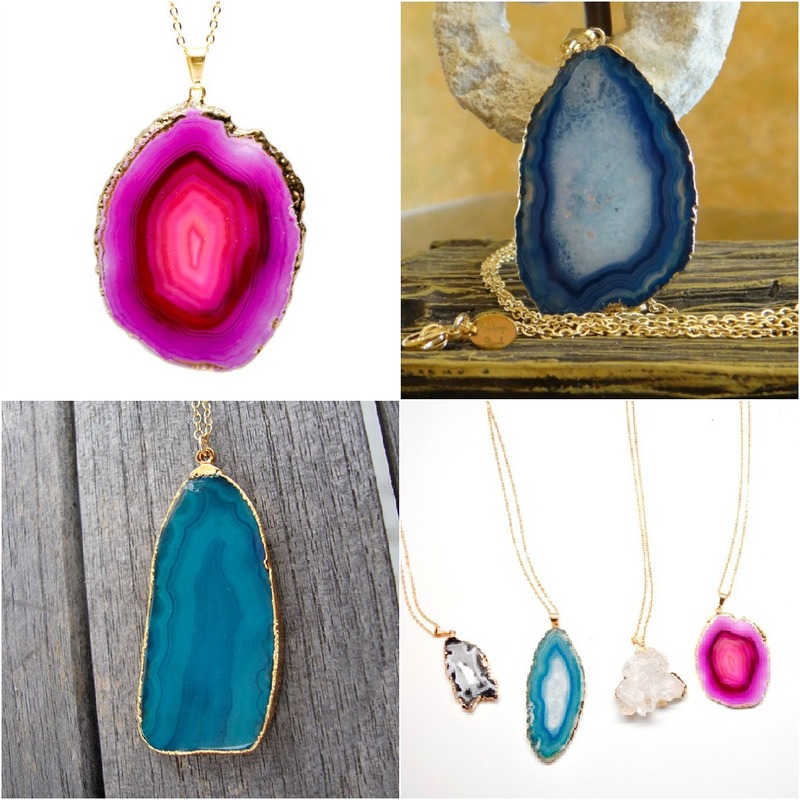 If I do get some more agate and make some for sale, I'll be sure to let everyone know on the blog to get first dibs! I LOVE THIS! 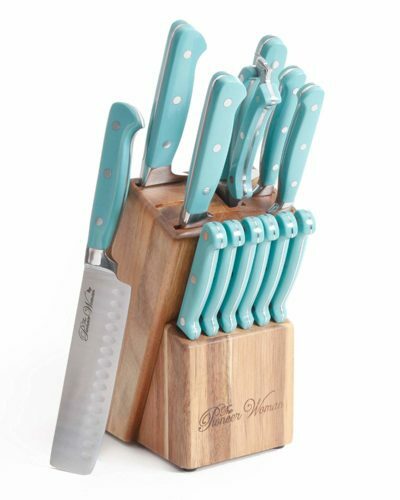 I really might have to try this – they came out so beautiful, t! 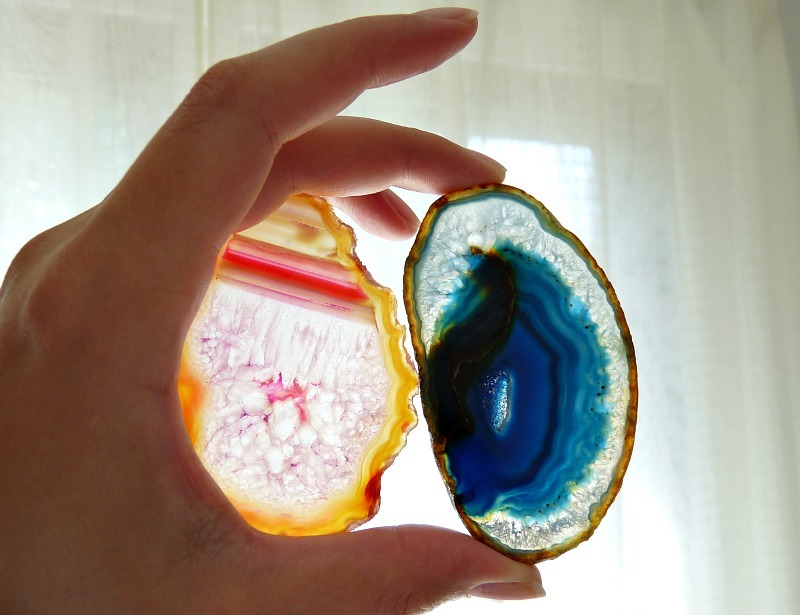 I'm a big agate fan – I have some really neat agate rings. But I'd love a necklace. And I'm always getting those 40% off coupons 🙂 And I second everyone else – I love the orange dress, and I'd buy this if it were in your shop! I'm realizing just how many dresses I have . . . I think every blog photo of late is me in a dress, me in a dress. Such false advertising because I'm totally wearing yoga capris and a ratty tank right now. P.S. Did we really need another thing in common, lol? Shopping with you will be a nightmare because we'll always be diving for the same thing. They are fantastic!! I was given a beauty by my hubby but the agate is huge and the chain is a double and together I feel like the neck cramps start 5 min after I put it on. I am definitely going to make something lighter. THanks for the tips! Oh, what a shame (but how sweet of your hubby). Anything you can do to alter it to make it more comfy? Those are just gorgeous. I love big, pretty necklaces, and you totally rock the orange dress and necklace. Awww, thanks Nicole! I've been buying way too much bright orange stuff this season, but it just lifts my mood for some strange reason. Definitely give it a go! And these would make sweet presents, too. More money-saving! These look so expensive…it's hard to believe you got buy with 2 for only $10! I think the size of the agate and the weight of the chain help to make the necklace look more fancy than it is. I picked a chain that was not too skimpy to look cheap, but not too big that it obviously looked fake. The stones, also, are not to big to look garish, but weighty enough that they are statement makers. 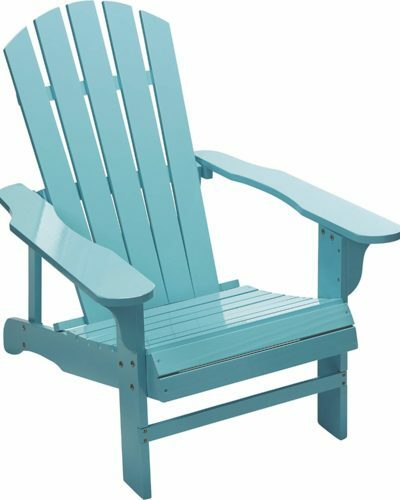 I love that photo of you in the orange dress with the bright blue necklace – it just popped out at me from my sidebar and I had to read your post. 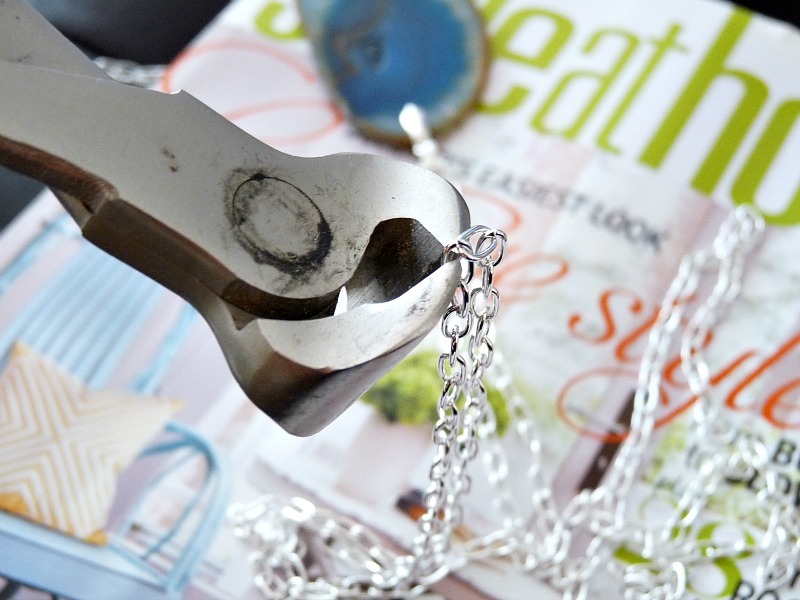 Your are quite the clever girl, making your own necklaces for so little money. I love them. Thanks, Grace. I am so shy about posting photos of me but for another jewellery DIY some blog friends demanded I "model" the jewellery instead of artfully propping it up. I've had other comments and emails about more Tanya photos. So I've been making an effort to post more photos, in this post and even the last. Happy to hear they're a "draw," lol. So fabulous! 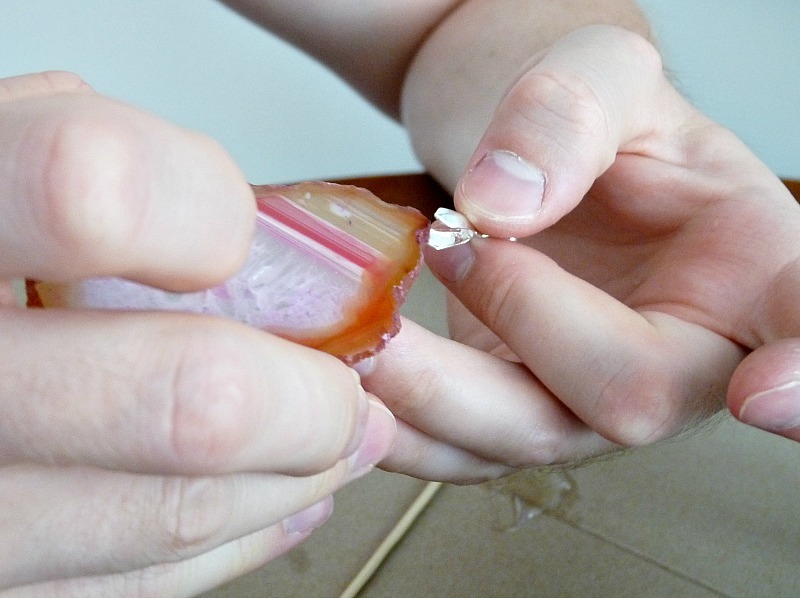 I have a DIY coming up with agates too! And it's not a necklace!!!! m.
Gorgeous, and so creative!! Your photos are stunning, and I love your bright orange dress! Awesomeeeeeeeeeee…Definitely going to try this. Thanks for sharing! 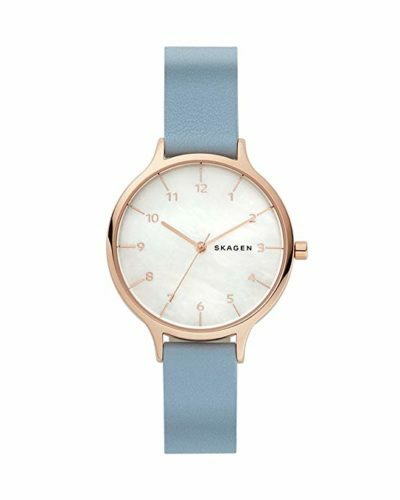 These are so gorgeous and I love that they'll always make you think of your trip (I actually always try to pick up a piece of jewelry – it doesn't have to be fancy – to remember trips by, but this is even better!). BTW, I finally got to open my September issue of Style at Home and saw your letter and pic – congrats! So pretty! It's gorgeous with that outfit. I am behind, but I am checking out your blog right now! These are super pretty! I like that they have special meaning too! These are beautiful! My grandfather used to hunt for, collect, and cut agate stones. 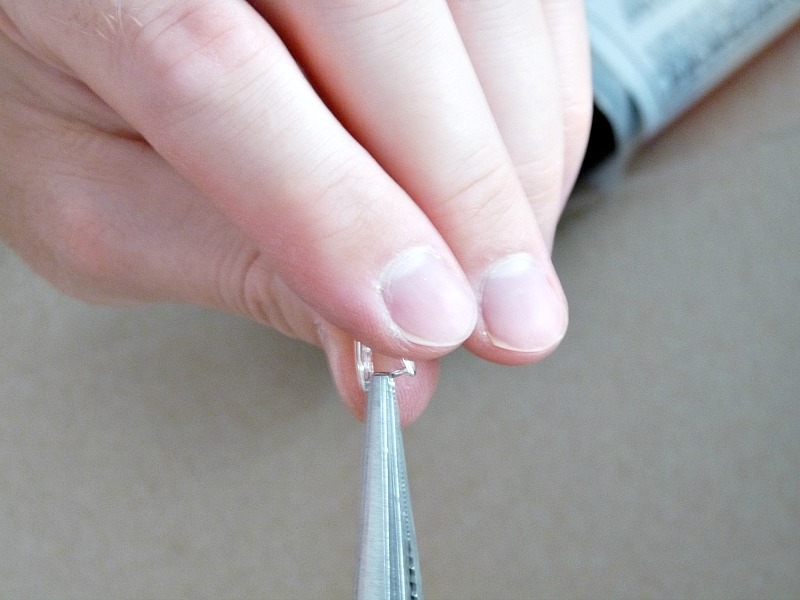 He would make small jewelry pieces with them. I've been wanting to continue this tradition, and this seems like just the perfect project to take on. Thank you for the inspiration! Oh, how amazing!! His jewellery must be stunning. I love that you're now going to follow the tradition. I'd love to see what you create. 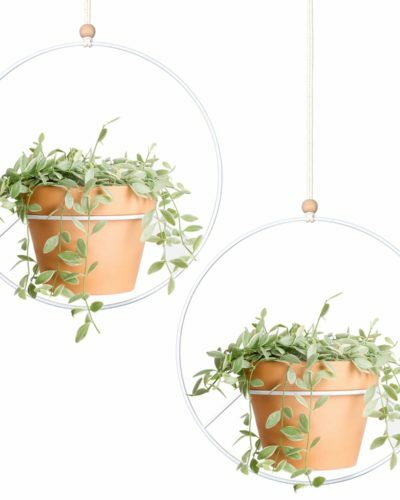 I've been lusting after those LEIF necklaces for ages! Great job on taking your own spin on them. So pretty! Wow, this is really beautiful. Great job! I would LOVE for you to link this up at my Ginger Jamboree Link Party!! These look great! I have one of these stones that I got years ago at the grand canyon but never got around to making it into a necklace. I really like the longer length, so you've inspired me to finally make one! New follower here! 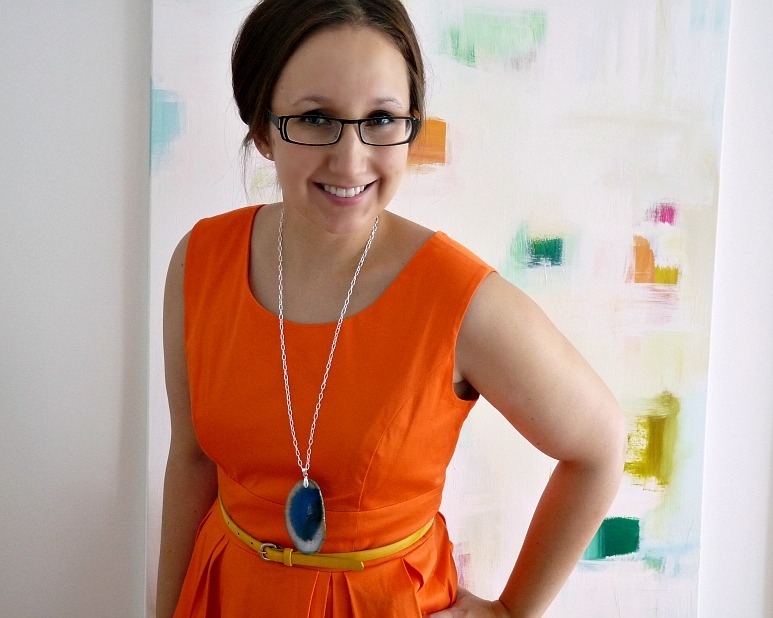 I love this project and I absolutely adore how you styled it with the orange dress! Another great project. I love your solution with the bail. Also a new follower. I recently bought a few agates from an antique/neat stuff store in Van Buren, AR. They were fairly inexpensive ($2/piece). I was wondering what to do with them. I thought about this idea, but you've made it look so easy – I'm definitely going to try it. Can't wait.Thanks for sharing your great ideas. Yesterday, my boyfriend bought me an agate slice and have been looking for inexpensive ways to make a pendant out of it and I came across your page and you're amazing! I wanted to ask, where do you get your chains from?